When you're recovering from a C-section delivery, doctors typically frown upon applying a lot of pressure to your abdominal area, which includes getting in and out of bed to calm down your crying baby. Since C-section pregnancies make up over 30% of all deliveries, its no surprise that millions of women find innovative bassinets to be a blessing. Halo is the manufacturer you want to rely on for revolutionary nursing gear that hospitals swear by, so you know that it’ll ensure an environment in which your body will not be put at risk. Don’t make the mistake most mothers make, which includes using a traditional bassinet before understanding all the available bassinet options out there. So by not taking the time to figure out the best bassinet option, those who underwent C-section deliveries end up living in discomfort, which makes it harder for their bodies to bounce back from after giving birth. When talking about breastfeeding your child, using a traditional bassinet will hinder your ability to check up on your child in a timely fashion. You can avoid letting your child endure a moment of hunger when you take advantage of what a Halo Essentia Series Bassinet has to offer. Keep reading for a detailed review of Halo Essentia Series Bassinet. For those who need extra help soothing their baby when it starts crying at a random time of the night, you should ditch your traditional bassinet and embrace the innovative designs of bassinets coming from 21st-century nursery gear manufacturers. Around the early 1990’s, a couple who had lost their baby to Sudden Infant Death Syndrome decided to take matters into their own hands and begin an extensive review of the newest medical research that dealt with the optimal ways to construct an extremely safe sleep environment specifically for babies. By dedicating their time to research addressing prime sleeping environments for babies, Halo's primary goal is to ensure other couples don't have to go through a loss of a child. Thankfully, the duo responsible for Halo has a background in engineering, so you can imagine the products to have come from the labs over at Halo. Halo initially released the Halo SleepSack: The Original Wearable Blanket, which limits the chances of your baby entangling itself with bed sheets or clothing while it soundly sleeps. You can trust the medical research Halo emphasizes since even hospitals all over America utilize Halo baby gear. As Halo made its way to the 21st century, it continued on its mission of providing gear that ensures a safe resting environment for your baby by expertly implementing smart innovation to construct products that are even safer and of higher quality than before. In regards to Halo Bassinest Essentia Series Bassinet, the manufacturer labels it as a revolutionary device that was inspired by Halo’s bassinet model initially designed for hospital use. This means you can purchase Halo nursing gear for in-home use while taking advantage of the fact that it is identical to the gear that doctors rely on to equip their hospitals. Nursing gear that ensures comfort and convenience for both the mother and the baby is rare to find, so you can imagine how surprised mothers are when they hear about the features that come with Halo Bassinest Essentia Series Bassinet. Halo improved on the complaints mothers had in regards to bassinets, which resulted in the creation of Halo Essentia Series Bassinet. Out of all the bassinets available in the nursing gear market, the Halo Bassinest Essentia Series Bassinet is the only one that features 360-degree rotation function along with swiveling abilities. 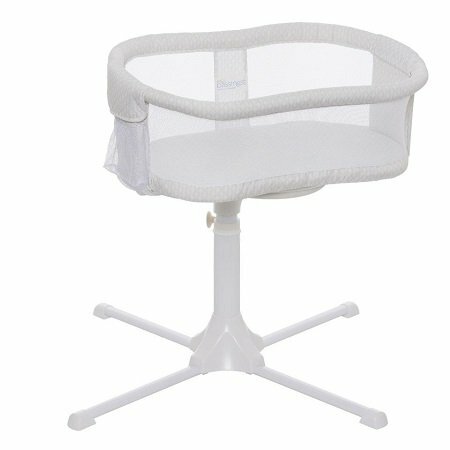 Buyers rave about the convenience that results from incorporating a Halo Bassinest Essentia Series Bassinet to be a part of your go-to nursery gear since it is a new and improved take on the traditional bassinet. 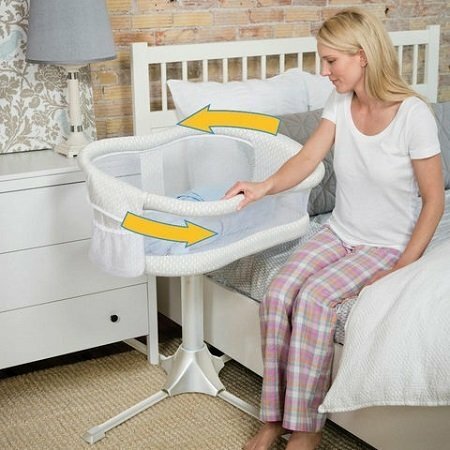 Halo Bassinest Essentia Series Bassinet comes with rotating and swiveling capabilities, so your baby can sleep next to you without you having to be wary of hurting it while you sleep. Keep in mind that you can also lower the sides of the Halo Bassinest Essentia Series Bassinet, so sitting up is no longer a requirement to be able to reach your baby. Based on positive buyer reviews, you should expect your life to become easier by the day when you rely on a Halo Bassinest Essentia Series Bassinet for your nursing needs. Halo Bassinest Essentia Series Bassinet removes the need for you to continually get out of bed since your baby will be situated right next to your head with eye level visibility. Thankfully, women who go through with a Cesarean delivery now have a bassinet option that will cater to their needs. After taking a look at all the online vendors that sell the Halo Bassinest Essentia Series Bassinet, a majority of buyers tend to lean towards Amazon for their purchasing needs. Even though Amazon doesn’t offer any discounts in regards to the overall cost of the Halo Bassinest Essentia Series Bassinet, the online retailer does offer yearly protection plans that function as additional insurance on top of the manufacturer's warranty that comes with the product in the first place. For under $200, the Halo Bassinest Essentia Series Bassinet can be situated on your bedside, giving your body the proper rest it deserves while ensuring your baby sleeps in a comfortable yet safe environment. 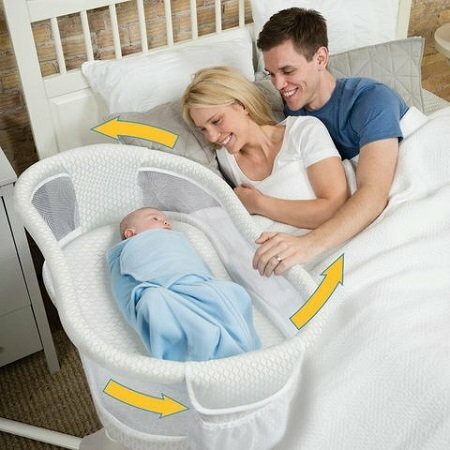 The price may seem steep for a product you’ll use for a limited time frame, but you can easily reuse this bassinet if you end up having another child. This is the perfect baby shower gift that will put into light your in-depth knowledge in regards to nursing gear, so the expecting mother will genuinely appreciate the fact that you bought her the ultimate bassinet available, the Halo Bassinest Essentia Series Bassinet. Keep in mind that the price tag on the Halo Bassinest Essentia Series Bassinet may seem pretty steep, but the perks that the product offers outweighs any doubts you ever had in the first place. I would highly recommend buying Halo Bassinest Essentia Series Bassinet, whether it's for yourself or a friend, it'll prove to come in handy during a pivotal time in a baby's life.